Island caves. Andaman blue. Surreal beauty on Krabi's southern doorstep. Only an hour from Krabi's airport, discover a natural refuge that feels like a land far, far away. A place with more pine trees than people, where silver beaches slope into the cerulean Andaman Sea, and tiny islands of primeval beauty dot the horizon. The private beach hidden within the interior of an islet. The flash of bright orange fins disappearing behind the coral. The fragrance of a specially selected oil as you listen to the sound of the waves. Dinner on a sandbank with a personal chef and a bottle perfectly chilled. A soak for two on a sheltered balcony, away from the crowds and the twinkling lights. Nestled in Trang province just south of Krabi, Anantara Si Kao Resort and Spa offers a romantic experience of Thailand's well-kept secret. A sanctuary on the doorstep of a sanctuary, Anantara Si Kao is situated along the edge of Chao Mai National Park which covers coastal areas and untouched islands . 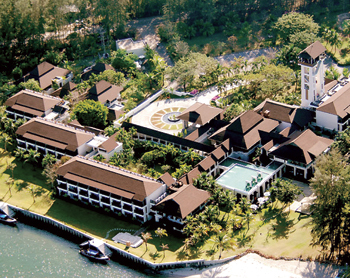 A flowing stretch of casuarinas, the delicate tropical pines of Thailand's southern coast, border the resort itself. Showcasing beautiful views throughout, the property overlooks a stretch of long white sand, the Andaman Sea and pristine islands beyond. Anantara Si Kao offers 138 guest rooms, each featuring private balconies overlooking the ocean or the Bill Bensley-designed tropical landscape. Anantara Suites offer expansive space, oversized bathtubs and polished teak furnishings, while the Anantara Pool Suites, with their own private plunge pools, redefine elegance and style. At Anantara Si Kao, the uniquely diverse geography of the area means white powdery beaches, majestic limestone cliffs, virgin rainforests, rich mangrove reserves, hidden caves and rushing waterfalls are all at your fingertips. The historically-rich town of Trang retains an unassuming provincial charm where the Sino-Portuguese architectural heritage still lingers and lives on. Anantara Si Kao offers you an enchanting experience in an unexplored corner of Thailand's southern coast. Views of the Andaman. Patios leading to lush Bill Bensley-designed gardens. Polished teak floors, piles of cream linens and delicate silk drapery. The comforts and luxuries of your personal retreat at Anantara Si Kao. All rooms come equipped with satellite television, DVD player, mini bar, tea and coffee-making facilities and high-speed internet to complete your Anantara at-home experience. Just a one-hour drive from Krabi International Airport, Anantara Si Kao offers sailing, waterskiing, kayaking, windsurfing, canoeing and other exciting water sports. The island surroundings and placid waters make Anantara Si Kao an ideal diving and snorkeling destination. Cast yourself adrift and sail into the sunset, then return to the plunge pool set on the beach front to enjoy a cocktail. Recharge with Anantara Wellness 360, the signature spa experience. Explore a wealth of exotic cuisines. Head to Anantara Spa for an Ayurvedic massage, or consult with on-site experts to create a personalized detoxification journey for increased health and vitality. Revel in the magical effects of soft late-day sun over an unforgettable seascape, while soaking in your suite's tub for two. Enjoy the romance of Trang and the indulgence of Anantara together. The open-air restaurant offers a mélange of world flavours with indoor and outdoor dining options. Start your day with a breakfast of fresh global dishes. Choose from a selection of exquisitely prepared European favourites and Thai classics for lunch. Delight your palate with bold and spicy southern Thai specialties at dinner. Cast yourself adrift on our romantic "daybed boat" and enjoy a wide range of beverages from refreshing smoothies to assorted flavoured teas. Settle into a cozy armchair and lose yourself in a good book from our wide selection of literary gems. Get your camera ready to capture the stunning view across the horizon as the sun sets. Relax on the plush cushions as live acoustic music enhances the mood for a perfect evening. Savour the best of the Italian provinces at this signature evening restaurant, located next to the river running through the resort, above the Beach House. Dine on the open air balcony with views of the sunset metamorphosing into a blanket of stars, or relax in the air-conditioned indoor dining room. The Executive Chef blends fresh and simple flavours in both the degustation menu and a la carte selection with daily bounty of local fishermen - line-caught fish, prawns, crabs. Other must-tries include Acqua antipasto platters, fine meats and dishes of local produce and seafood enhanced with imported delicacies such as truffles and gourmet olive oils. Enlist our wine guru’s help in deciding upon the perfect bottle for your meal. Sit and lounge, looking over the ocean and catching up with the world on the café's Mac books with wireless connections. Liquid creations include the finest coffees, teas, juices and smoothies. Culinary highlights to savour include a diversity of light and healthy options, grilled focaccias and quiches. For guilty pleasures, try our famous chocolate brownie. Fashion a romantic dinner for two on our sandbank and let your own acclaimed personal chef surprise you with a one-of-a-kind Anantara experience.